Most amateur golfers take aiming their putter for granted despite the fact four out of five amateurs aim their putter as much as six-inches off target on a straight 12-foot putt! With the unique Two Bar Alignment System, your aim will improve without making any changes to your setup. The Two Bars frame the ball and create a railroad track effect right to your target. Whether aiming a driver, iron, or putter, there is no better visual in golf than the railroad track. And with the Two Bar Hybrid the railroad track visual is built right into the putter, which makes aiming your putter correctly easier and more accurate than ever before. Rife's new Dual Response Insert technology allows the Two Bar Hybrid putter to have even more gripping effect because the CNC milled grooves grip the ball and the polymer backing absorbs the hit, allowing for slightly more dwell time. This creates even more control over the spin of the golf ball, which is the key to all aspects of golf. Putting a true and consistent roll on the ball is, without a doubt, the most important fundamental to being a great putter. The top putters on Tour just seem to get the ball rolling consistently time and again. But even the best players in the world need a little help from technology to get the most consistent and truest no skid roll in golf. The precisely milled and spaced grooves hold and release the ball into an immediate forward roll without any skipping or skidding (all Rife Putters feature RollGroove Technology). 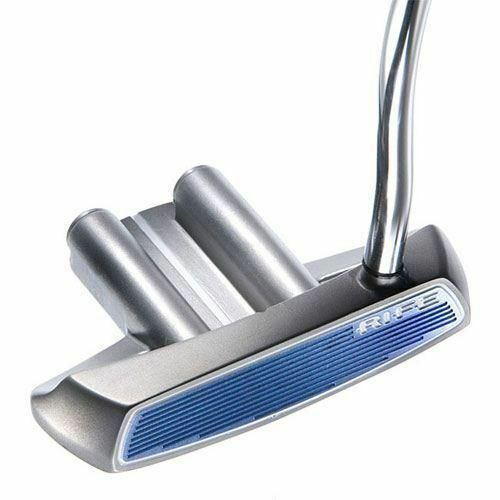 Because of the gripping created by the patented RollGroove technology, all Rife putters feature less loft than most other putters on the market (1.5-2 degrees). Head Weight: 345g w/light wts. & 360g w/heavy wts. for submitting product review about Rife Hybrid Blade Putter.